I doubt anyone has ever said, “my luggage isn’t heavy enough. I should have packed more.” Who wants to feel like a pack mule while on vacation? Not this woman. Over the years, I’ve learned tricks that have allowed me to pack less. These tips have saved me a lot of unnecessary back pain and inconvenience, so I thought I would share several of them with my readers. Consider what’s already available. People tend to be creatures of habit and we want all the comforts of home, like the hairdryer we use or the iron. I’ve yet to see a hotel or even Airbnb for that matter that didn’t offer a hairdryer for lodgers. Irons are often available, too. Those appliances may not be as nice as yours, but do you love yours enough to carry it everywhere? If I’m staying in a hotel, I don’t pack shampoo, conditioner, or soap either. My hair and body can handle not having their regular products for a couple of weeks. Conversely, I evaluate which products I can purchase at my destination for the same price. If I really want a certain product, I may just buy it there and then leave it behind. Don’t pack for worst-case scenarios. A few bandages aren’t going to take up too much room, but a full emergency kit just isn’t necessary unless you’re traveling to a remote area of the world where pharmacies aren’t available. Minimize the size of your toiletries. This can be done by purchasing travel-size items or buying travel-size containers. I like the squishy, silicone containers that allow you to squeeze out every last drop of shampoo, conditioner, or cream. I also keep little trial-size containers for my facial moisturizers, eye cream, and serums. Make sure travel gadgets make sense and will be used. Those bulky travel pillows, coffee mugs, and water bottles can take up unnecessary space. I just buy a disposable water bottle when I get to my destination and reuse it. Same goes for coffee mugs. As for pillows, when I need one for a long-haul flight I use the kind that are inflatable so I don’t have to worry about carrying an awkward ring around. Ziploc bags are awesome. I use snack-size bags for vitamins, medicines, and jewelry. They take up hardly any room making them much less bulky than a bottle of aspirin or a container of one-a-day vitamins. The little bags keep my jewelry from getting tangled, too. All my liquids go in a quart-size Ziploc bag making getting through security points quite easy. They do the double-duty of protecting the rest of my luggage from unnecessary spills. Anything that I think could leak goes in a plastic bag. I bring a few extras, too, for wet clothes. Pack a foldable bag. I have a 35-liter packable backpack that weighs .7 pounds and folds into a package that is approximately 8″x8″x1″. I use it for day trips and then to have a separate carry-on bag in case I buy too many souvenirs. And I often buy too many souvenirs. Clothes should mix and match. This probably goes without saying since every packing article mentions it, but it’s important. Make sure clothes are in the same color palette. Choose items where you won’t need a bunch of different undergarments. Select darker-colored, light-weight clothes for versatility. I recommend having only two pairs of shoes total–one comfy pair that you wear and one dressier (but still comfortable) pair that you pack. Shoes can be heavy, so pick the two pairs that will make you feel footloose and fancy free. 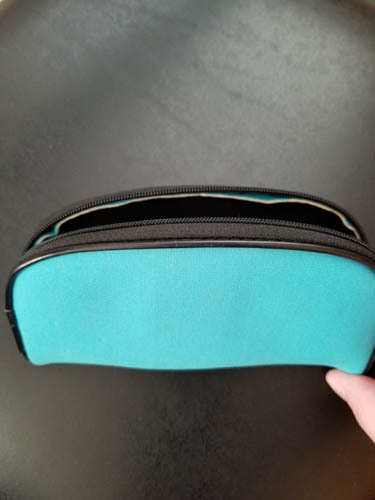 Buy cloth, zippered eyeglass cases from a dollar store. These are awesome for storing earbuds, chargers, and cords. Start with lightweight luggage. My hard-sided polymer bag weighs only eight pounds, but can withstand being thrown around better than a cloth bag. Even when fully loaded I can easily lift it into an overhead bin. Most importantly, and I can’t underscore this enough, make a packing list. Think about each item you pack. Evaluate the likelihood of using it. Try on all your clothes and make sure they look good together and make you feel good when you’re wearing them. I make sure I can wear tops with multiple bottoms. I bring one cardigan that goes with every shirt, so my short-sleeve and sleeveless tops can become long-sleeved. If there isn’t a 90% chance I’ll wear it, I don’t pack it. I itemize each piece of clothing on my packing list too, which helps curb excess. Seeing a list of every toiletry, clothing article, and gadget helps me determine where I need to pare back. Pack your list in the bag when you’re done so that you can make sure everything you left with comes home with you. Buon viaggio!